House and time at Malvern: Sch, 1901 - 1905. Died: 02 July 1917 aged 30 in France. Killed in action at Bailleul. Son of J. H. Horsley, Keyston Manor, Huntingdon, b, 1887. Middle IV B—Modern II. House Prefect. Formerly Sheep-grazer in New Zealand and Cattle Rancher in the Argentine; Farmer in England. Great War (overseas), Captain East Yorkshire Regt. ; Flying Officer 53rd Sqdn. Royal Flying Corps and General List. 'He was a quiet steady boy who won his way to authority in the House and showed promise of developing into a valuable man. On leaving School he went out to New Zealand and later proceeded to the Argentine. When war broke out he was farming in England. He joined up at once and received a commission in the East Yorkshire Regiment. He went out to France in command of Trench Mortar Batteries. He had lately transferred to the Royal Flying Corps.' (Malvernian, Jul 1917). 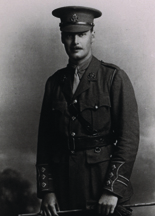 He served first with the East Yorkshire Regiment in Egypt, and then in France where he commanded his Brigade Trench Mortar Battery in the Battle of the Somme where he was awarded the Military Cross. In the autumn of 1916 he joined the Royal Flying Corps, and returned to France in June 1917 and was killed a month later on the 2nd July 1917. His aircraft was a Royal Aircraft Factory R.E.8 (serial no A3249).